Magnolia has a population of 60,000 inhabitants, and is a merchant city that has been prosperous in Magic since the ancient era. Magnolia is located in the southeastern part of Fiore, with the sea and Hargeon Town not too far to the south, a series of minor built-up areas linked to it by a railway line to the north, and the state boundary with the nation of Bosco to the east. 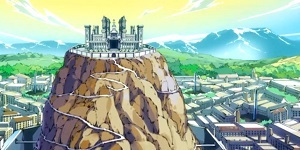 This is where the former Fairy Tail guild located. 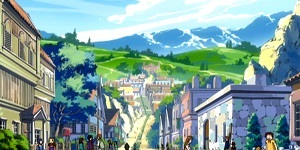 Shirotsume Town is a small town located in a mountainous area. It has a feudalistic government and totally controlled by a single man. The town is close to Magnolia, but to go to Shirotsume, you need to walk because there's no railway station. 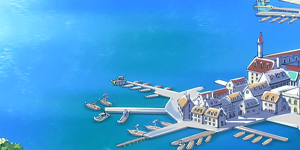 Hargeon is located in the southern part of Fiore, near Magnolia Town. Hargeon is one of the Fiore's ports and also one of its most beautiful old towns. 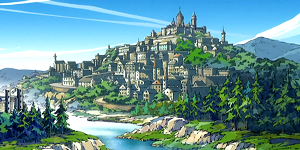 The town is more prosperous and renowned in fishing rather than Magic, because only 10% of the people in the town have the ability to use Magic. Oak Town is located in the northeast part of Fiore. Oak Town is an old castle town. It is situated on a hill, surrounded by forests and mountains, with the river flowing nearby. The city is historic, with numerous turrets and battlements. It is located spherical and completely covered hill on which it is located. 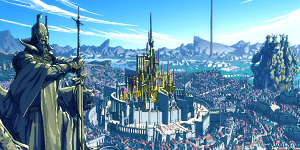 In the center, towering above the town there is a castle, once used as the urban branch of Phantom Lord Guild. However, the new Sabertooth decided to open their guild here. Crocus is the capital of Fiore and the city where the king lives. It is also the place where the Grand Magic Games take place. Crocus resides in a vast valley surrounded by rocky mountains of small-to-mid height, housing mostly mildly prominent hills, and has a small river not far from it, with some isles in its largest part, flowing in a similarly small gorge, which has woodland on both of its sides, occupying the western zone of the valley. 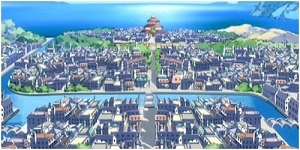 In the central part of the town lies a large, round lake; in its center, linked to the surroundings by a pair of bridges, sits Mercurius, the King of Fiore's palace. On the mountains to the west, on a large, cylindrical stone formation, is the arena for the Great Magic Games, the Domus Flau, linked to the town by a long, curved bridge made of stone, possessing several towers.